A special set of stamps was issued earlier this year to mark the golden wedding anniversary of the Prince Hans-Adam II and Princess Marie of Liechtenstein. In addition to the actual stamps, a special version featuring gold foil and a small ruby was also issued. 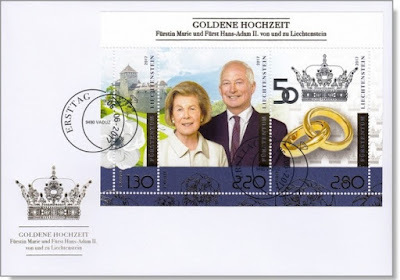 Proceeds of the stamps go to the Liechtenstein Red Cross that was headed by the Princess for thirty years between 1985 and 2015. Hereditary Princess Sophie took over the Presidency of the organisation two years ago. It was she who received the first donation earlier this month. 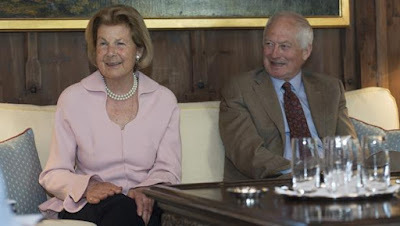 Prince Hans-Adam II and Princess Marie are celebrating their golden wedding anniversary today. The couple is spending the day with their family at their holiday home in Styria with no big celebrations planned. To mark the occasion, the couple also gave interviews to Liechtenstein's major newspapers, Volksblatt and Vaterland. In the interviews, the couple talked about falling in love, their wedding and honeymoon as well as flying under the radar of the international media. Below are translated excerpts from the interview with Volksblatt. You have been married for half a century now. But truth be told, you weren't immediately smitten by Hereditary Prince Hans-Adam, Your Serene Highness. He was very young when you first met, wasn't he? Princess Marie: That's true. Our fathers went to the same school in Vienna and regarded each other very highly. My aunt was married to Prince Hans and lived in Vaduz. During the holidays, we visited our aunt. Princess Gina knew about it and invited us to the Schloss as her children were bored. Hans-Adam saw me and immediately fell in love. Prince Hans-Adam: Yes, I was 16 years old at the time. I knew right away: I want to marry her. But I needed a while to convince her. There were several others who were interested in her. I was very young and still went to school in Switzerland, so I was much too young to marry. How did you keep in contact? Princess Marie: I lived in Munich at the time. We wrote a lot of letters to each others, speaking on the telephone was very expensive back then. I still have all the letters. How did he finally sweep you off your feet, with expensive gifts? Princess Marie: His intelligence, his natural happiness and his humour all played a role. Prince Hans-Adam: Yes, that was the way it was. My parents told me that I first had to finish an economics degree. Princess Marie: Yes, not only your parents. Then Prime Minister Alexander Frick also wanted you to study economics to save the monarchy. When you were married, you were only 22 - today many people marry much later. Your oldest grandson is now at the same age, would you recommend him to marry so young? Prince Hans-Adam: Yes, if he has found the right one. The search for the right wedding dress probably wasn't an easy one either. Prince Hans-Adam: Yes, you thought that the dress could only be made in Paris and then travelled there with my mother. 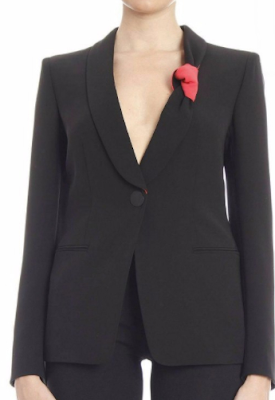 Princess Marie: Yes, we went to famous couturier Jacques Heim. It was very time consuming to go back and forth a couple of times, but it turned out to be a beautiful dress. Princess Marie: Yes, I do. One question you didn't answer back then [during the press interviews] was where you would go on your honeymoon. You only told later that you went to Mexico. Princess Marie: Yes, we first went to Paris and then to Mexico. It was simply wonderful. Prince Hans-Adam: We were in Paris as Mister Ritz had invited us to come stay in his hotel. He knew my parents and it was his wedding gift. That was an opportunity that we couldn't pass up. He thought it was a great PR for him and so it became known pretty quickly. After a few days, we went to Mexico. We were able to have a quiet and relaxed time there. It was probably too far away for people to recognise us. Princess Marie: We liked Mexico very much. We rented a car and went from Mexico City to Manzanillo and took a lot of detours. We knew someone who had a hotel in Manzanillo on the Pacific Ocean. Is there a reason why you try to avoid the press? Princess Marie: You know, it's pretty invaluable that we are able to move around freely. In other monarchies, that is different. It's very burdensome for people if they are constantly followed around. Prince Hans-Adam: Yes, we had an experience with the British royal family. My parents were friends with the British royal couple. Prince Philip, the Queen's husband, often came here to Liechtenstein on his own and liked the peace and quiet. He took my mother's car, just drove around and painted in the nature. He speaks German very well and was always very amused when he was asked by the mountain farmers in Triesenberg "What are you painting there?" (in local dialect using the informal "Du" instead of the normal "Sie" for people you do not know in German) without knowing who he is. Prince Philip thought that his children would be able to ski here without much attention. Then he came with Princess Anne and Prince Charles. However, there was a leak at Buckingham Palace and the press knew they were coming. There soon was speculation that I was to marry Princess Anne and that my sister Nora and Prince Charles were to to wed. When they were here, we were basically flooded by journalists. We saw what a hype it was and what it would mean. The press people even rented helicopters to take good pictures and tried to bribe our staff. We had to leave the Schloss in the back of a delivery van of a local bakery. That was pretty adventurous and not in a good way. We learned from it and decided to keep our value to the market low. Since then we try to be photographed as less as possible. It helps our children and grandchildren who are, like my wife said, able to move around freely. In contributes to our quality of life. How do you experience it whenever you are out and about in Liechtenstein? You surely are being recognised here. Princess Marie: Yes, it's very good for us here. The people have a very good intuition: I find them to be very respectful. The people smile and greet us, but they don't come up to us and take pictures when we are eating pizza somewhere. Prince Hans-Adam: We have a very normal contact with the people. That was already the case for my parents. It's one of the advantages of a small country. Were you equally adamant as a father [as you were in political matters]? Prince Hans-Adam: From an early age on, I tried to raise my children to think independently. I also discussed political matters with the from early on and asked them what they would do in my place. Alois knew that he would take over the state affairs one day. Maximilian has always enjoyed working with numbers, even when he was a boy he had an interest in economics and finance. Therefore I always hoped that he would one day take over LGT. Constantin always loved nature, already as a young boy. He got his shooting license early on and was interested in forestry and agriculture. That's the reason he is now responsible for that part of our properties, the estates and forests in Austria as well as the rice business. With the rice and seed business we are active in North and South America as well as India now. Princess Marie: I think our children always knew what he wanted from them. On the other hand, he was always a very humorous father, we laugh a lot together in our family. He couldn't have been a better father. But children should know that you have to learn and work to have it easier later in life. We also see it in our grandchildren that it has been passed on. You have no less than 15 grandchildren! Are you a normal Nana and Neni (grandmother and grandfather) who well and truly indulge their grandchildren? Princess Marie: Well, we try not to indulge them too much. That would be wrong. But of course we are affectionate and love them very much and like to spend time with them. That's only natural. Princess Marie: Well, the children of the Hereditary Prince, who live here, are already a bit older and study abroad. So we don't see each other that often anymore. The whole family really is together once a year for Easter. Everyone is coming to the Schloss for the weekend. 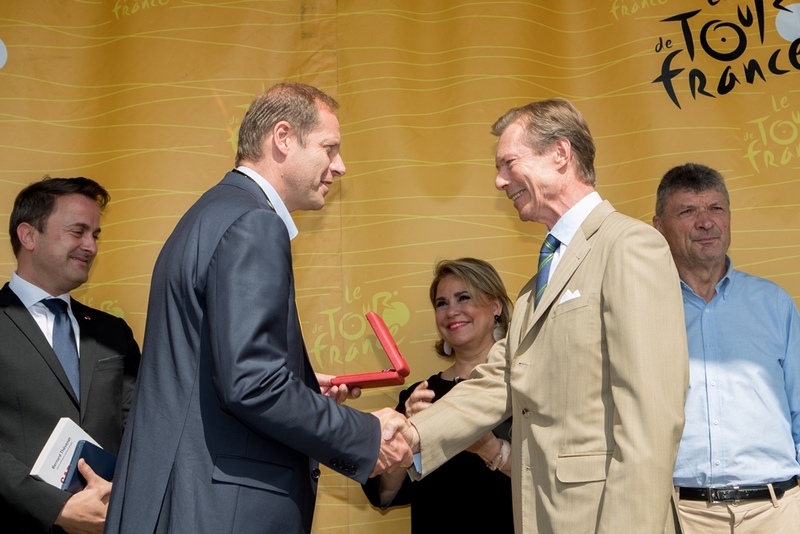 Prince Hans-Adam: In addition, we regularly spend our summer holidays together on our estate in Styria. That is also where we are going to celebrate our wedding anniversary. Will there be a major celebration? Princess Marie: No, no ball or something along those lines. Our house would be too small for that. It will be just wonderful to all be there and spend time together. P.S. This is an unofficial translation of the interview done by us. To learn more about the wedding of Prince Hans-Adam and Princess Marie, have a look here. We also have a two part biography of Princess Marie which also includes bits and bops of their courtship, to be found here and here. On January 19 of this year, the cour grand-ducale announced the decision of Prince Louis and his wife of ten years Tessy to divorce. A month later, the decree nisi was issued by a London court though, as we were informed by the cour, this didn't mean that the couple were divorced yet. This then, we haven't heard any more news about the couple's relationship status. Prince Louis as since not had any official events and has only attended two kinda public family events, the baptism of his nephew and the civil wedding of his cousin Marie-Gabrielle. I say kinda, as pictures were only received afterwards. Over the past week or so, the cour grand-ducale has removed the biography of the probably already former Princess Tessy from their official website. Gone as well as the family pictures of Prince Louis, his presumably former wife and two sons. Apart from wondering about the fact why the photos of Prince Gabriel and Prince Noah were deleted as well, it is probably a sign that behind the scenes the divorce has either been finalised or is in the last stages to being finalised. The only mention of Tessy in Prince Louis' section now reads as, "Two sons were born from his marriage with Tessy Antony: Prince Gabriel Michael Louis Ronny, born in Geneva on March 12, 2006 and Prince Noah Etienne Guillaume Gabriel Matthias Xavier, born in Luxembourg on September 21, 2007." Louis' biography neither mentions his wedding date nor the divorce date. Earlier this month, Princess Hisako of Takamado, member of the Japanese royal family, visited Ireland to commemorate the 60th anniversary of the establishment of the diplomatic relations between Japan and Ireland. On her way to Ireland, she apparently dropped by the Grand Duchy. A very crappy Google translation of a Japanese article tells us, "On the way, I was dropped by Luxembourg at the invitation of a famous friends Henri Henri." 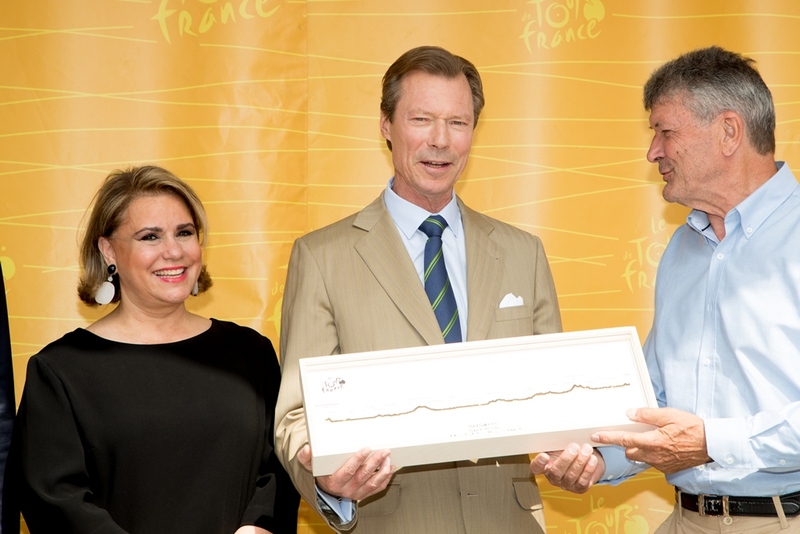 Let's assume that this 'famous friends Henri Henri" is indeed the Grand Duke. From July 10th until July 13th, the Palais grand-ducal opened its doors to local students from Cycle 4 of the educational system. This is the seventh consecutive year the palace has welcomed students (see here for last year), in collaboration with the Luxembourg City Tourist Office (LCTO). Students learned about the history of the Palais grand-ducal, in addition to how the Grand Ducal family lives and works. 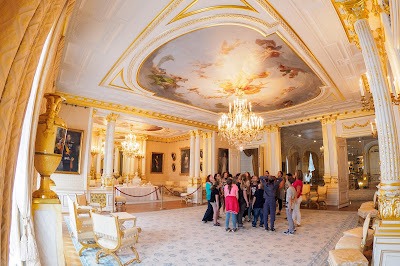 The tour also included information about the art and decor within the palace. The students tours totaled more than 800 young people from 28 different schools. The visitors were first welcomed by a palace staff member and then guided on the tour by a guide from LCTO. The students also got a sneak peek of the upcoming exhibit "1817-2017 : Bicentenaire de la naissance du Grand-Duc Adolphe¦ un «luxembourgeois» de cœur et d’âme" ("1817- 2017: Bicentenary of the birth of Grand Duke Adolphe, a 'Luxembourgeois' with heart and soul"), which will be opened to the public at the annual Palais grand-ducal opening that starts July 15th and runs through September 3rd. 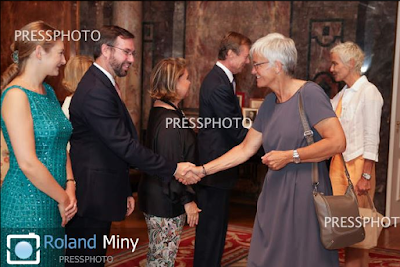 Back in May, Prince Guillaume and his wife, Princess Sibilla, attended an event on the White Paper on the Future of the European Union. Also in attendance was Ms. Yuriko Backes who is the Head Representative of the European Commission in Luxembourg. Ms. Backes tweeted a picture of herself with the royal couple. The White Paper outlines five options for the future of the European Union. You may read more about the White Paper at the European Commission. 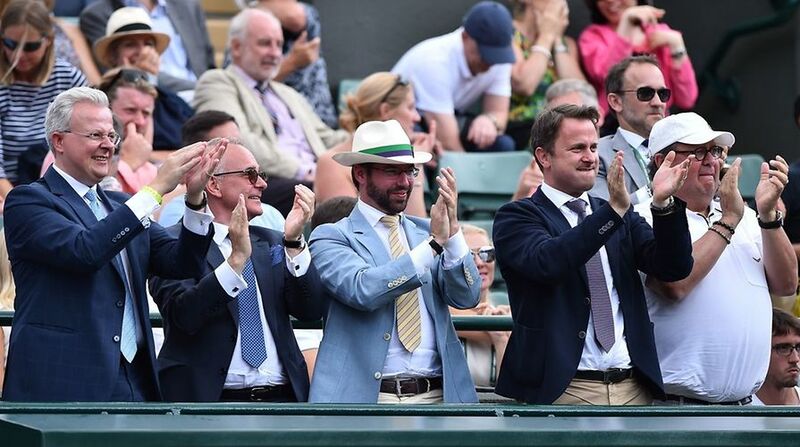 Another day at Wimbledon, another grand ducal spectator. 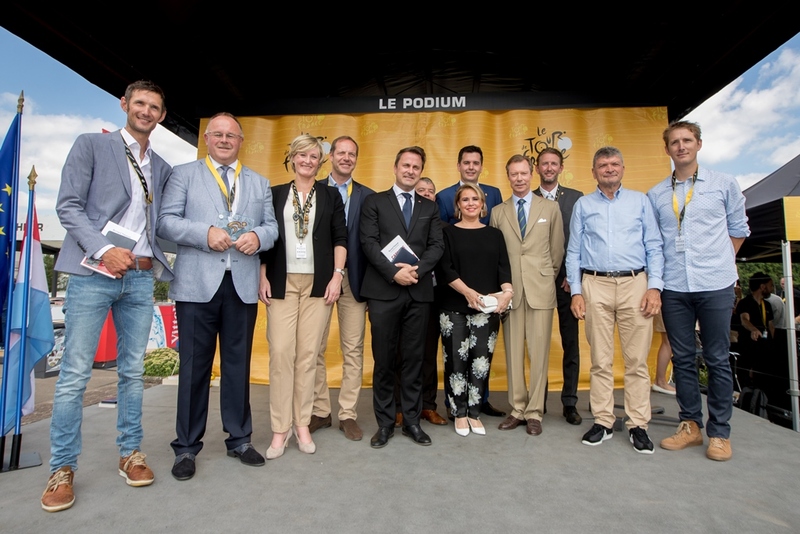 This time it was Hereditary Grand Duke Guillaume's turn to support Gilles Müller. 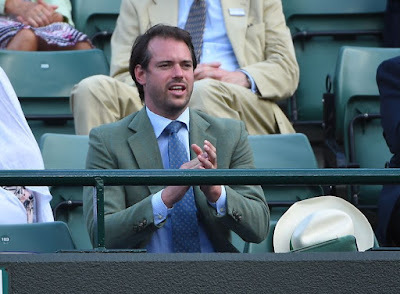 Unfortunately, the Hereditary Grand Duke didn't turn out to be the same lucky charm his brother Félix was a few days ago when Müller beat Rafael Nadal to advance to the quarter finals. Today, he faced Marin Cilic and lost in a five set match with 6:3, 6:7, 5:7, 7:5 and 1:6. Nonetheless Müller got big cheers from Hereditary Grand Duke Guillaume and Prime Minister Xavier Bettel. A bunch of more pictures at Wort. Yesterday, Grand Duke Henri attended the opening ceremony of the 43rd edition of the Assemblée parlementaire de la Francophonie and the 8th edition of the Assemblée parlementaire de la Francophonie. The parliamentary assembly celebrates its 50th anniversary this year. 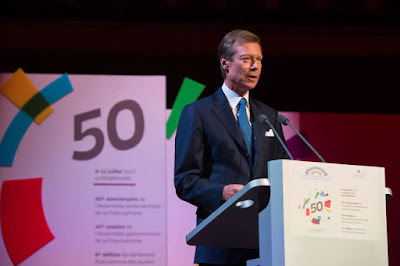 The International Organisation of La Francophonie comprises of 57 member states and governments, three associate members and twenty observers. French is one of the three national languages of Luxembourg and the Grand Duchy is also a member of the organisation. More information at Tageblatt, more pictures at the cour. 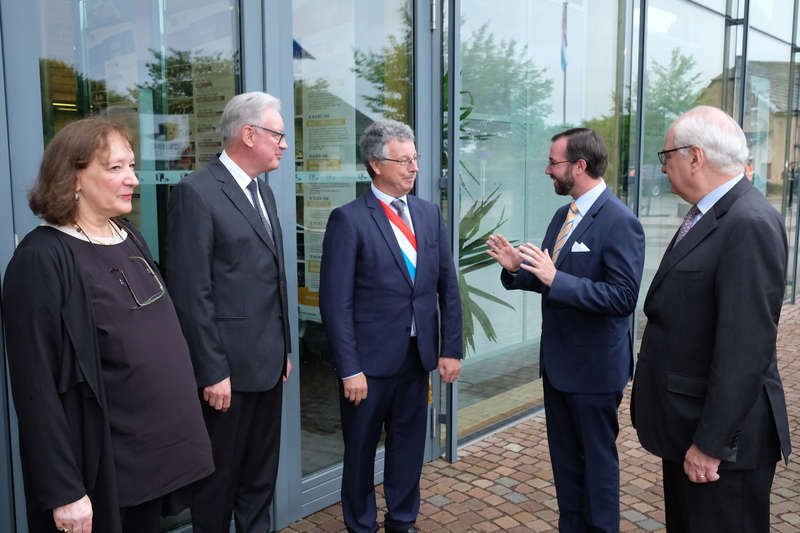 On the 7th, Hereditary Prince Alois attended the two-years-in-the-making opening of Technopark Liechtenstein, which aims to support start-ups in the Principality. 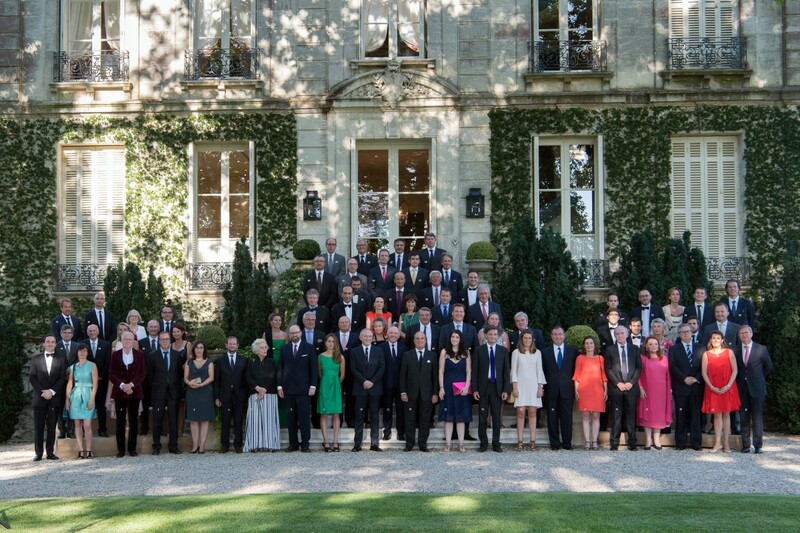 The Hereditary Prince was joined by a number of individuals active in business, science, and politics. Deputy Prime Minister and Minister of Economics Daniel Risch spoke at the event, along with Magnus Tuor, the Chairman and co-founder of Technopark. Technopark Liechtenstein currently supports several start-ups, with at least six more in the application process. A little more information at Volksblatt. 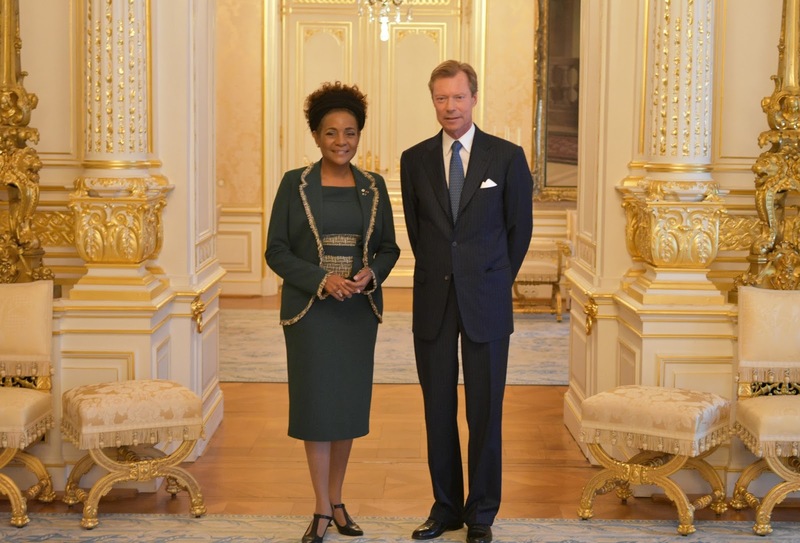 On the 10th, Grand Duke Henri received in audience the Secretary-General of La Francophonie, Michaëlle Jean. She is currently in Luxembourg as part of the 50th anniversary celebration of La Francophonie's Assemblée parlementaire. Probably a bit of Luxembourgish sporting history was written today as Gilles Müller beat Rafael Nadal with 6-3 6-4 3-6 4-6 15-13 in a thrilling round of sixteen match at Wimbledon. 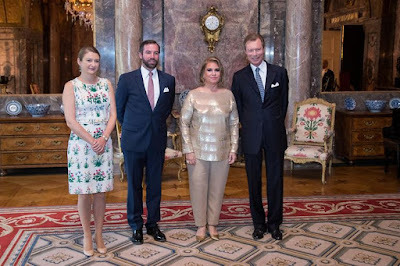 There to witness the occasion was Prince Félix. Müller, currently the world number 85, will next face Marin Cilic of Croatia. About the royal spectator Müller said after the match, "I heard he was going to come. We know each other. He's a big tennis fan. The whole family plays tennis and likes tennis. It was fun to have him here." It's the wedding season and back in June there was another noble wedding attended by a member of the Luxembourg and Liechtenstein families. 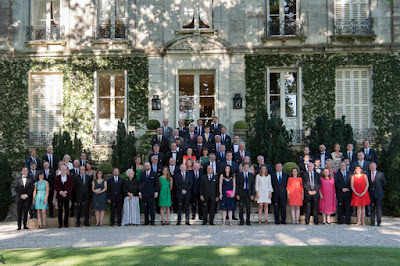 This time around it was Princess Alexandra who was among the guests for the wedding of the Honourable Charles Astor, only son of Lord and Lady Astor of Hever, and Princess Eliane de Mérode, only daughter of Prince and Princess Leonel de Mérode at Château de Guignicourt in Guignicourt-sur-Vence in France. Today, Hereditary Prince Ernst-August of Hanover married his longtime girlfriend Ekaterina Malysheva in, you guessed it, Hanover. 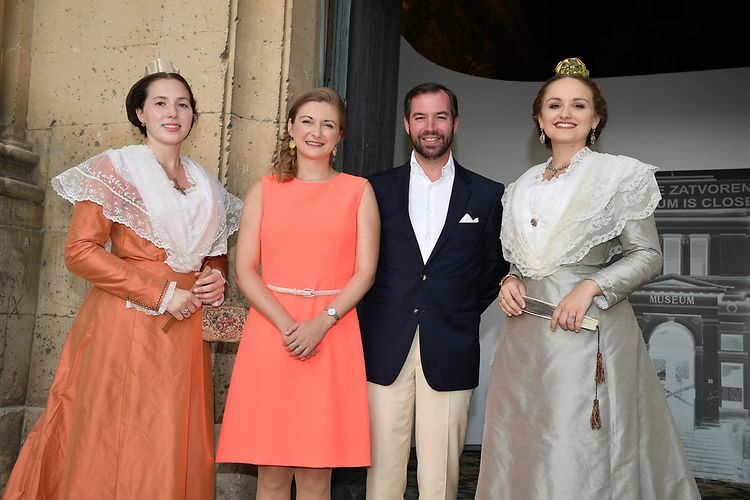 Among the guests for the religious ceremony at the Marktkirche was Princess Anunciata, niece of both the Grand Duke of Luxembourg and the Prince of Liechtenstein, and her boyfriend. A reception took place afterwards at the Herrenhausen Gardens with the evening party taking place at Schloss Marienburg near Hanover. Yours truly was also in Hanover today to snap a few pictures and so you can see more about this wedding and its guests over at Castleholic. 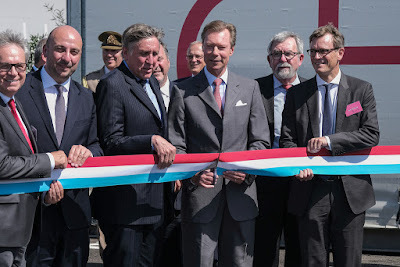 On Friday the 7th, Grand Duke Henri was also present for the opening of a new rail terminal that will hold up to 300,000 containers. The terminal, which spans 33 hectares and cost 221 million euros, expands the traffic options and increases the opportunities for trade. A large hall of more than 30,000 square meters opened on the site in January and has space to hold up to 46,000 pallets. 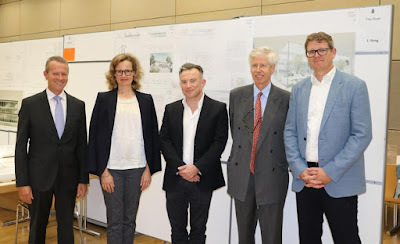 François Bausch, the Minister of Sustainable Development and Infrastructure, and Deputy Prime Minister Etienne Schneider were also in attendance for the ribbon-cutting ceremony. A little more, including a video, from RTL. 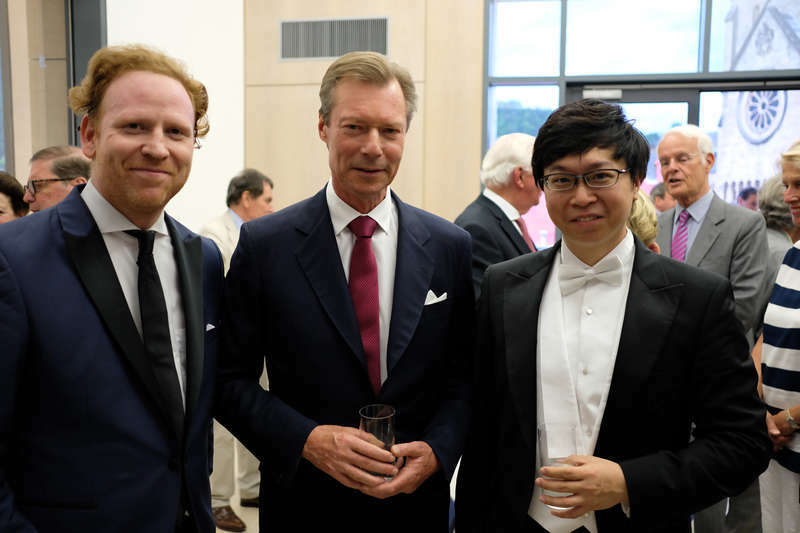 On the 7th, Grand Duke Henri attended a concert by the Orchestre Philharmonique du Luxembourg (OPL), as part of the Festival International Echternach. The current artist-in-residence, British violinist Daniel Hope, also performed the Philip Glass Violin Concerto, with the rest of the concert including music by Pärt and Tchaikovsky. Kahchun Wong conducted. 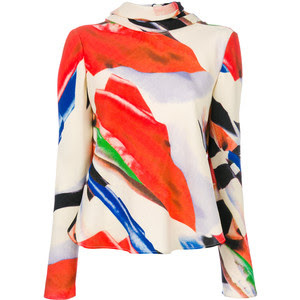 More photos from the Cour website. On the 7th, Grand Duchess Maria Teresa was in the Merl district to award graduating students of the Lycée Technique pour Professions de Santé (Technical College for Health Professions). The students included members of the nursing and health sciences program. The Grand Duchess also gave a speech for the event. A few more photos from the Cour website. 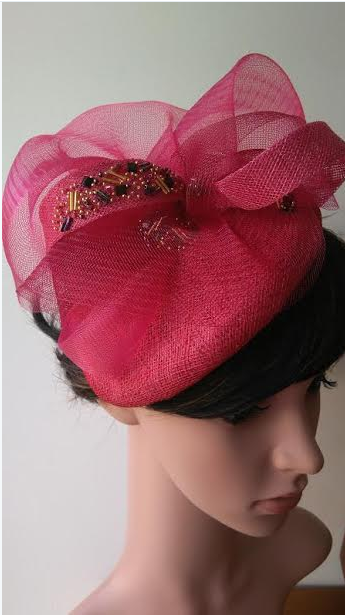 After the special National Day edition in the last Fashion Friday post, we're back to the normal edition. 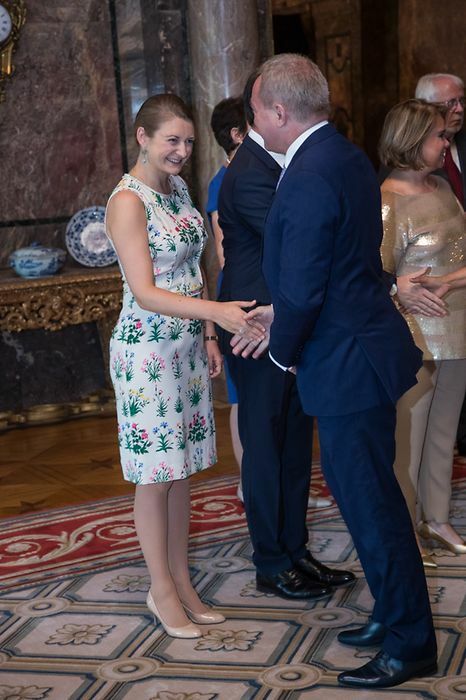 For the first Garden Party on July 27th, Hereditary Grand Duchess Stéphanie wore a new blue dress that I haven't been able to identify yet. 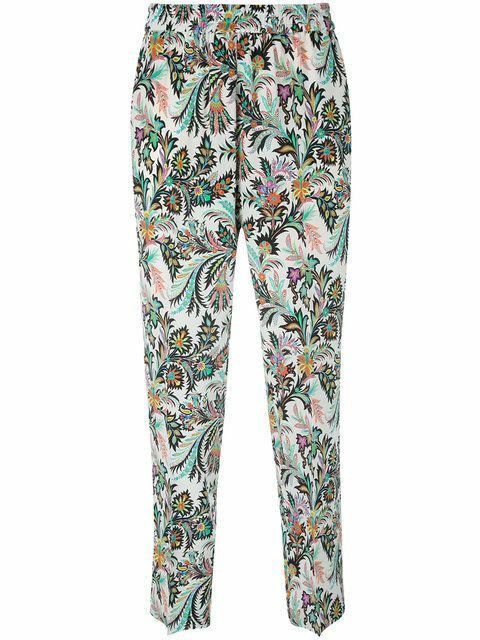 Grand Duchess Maria-Teresa wore a black top with Etro printed cropped trousers. While in Geneva on June 29th, Maria-Teresa wore two outfits. 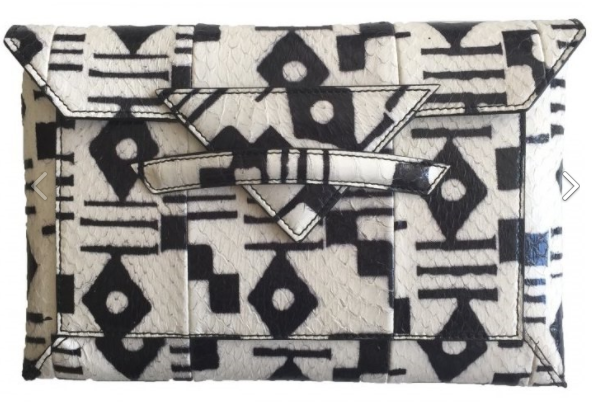 The first one was her white Armani jacket (also owned in red and in black) with a Sophie Habsburg clutch. 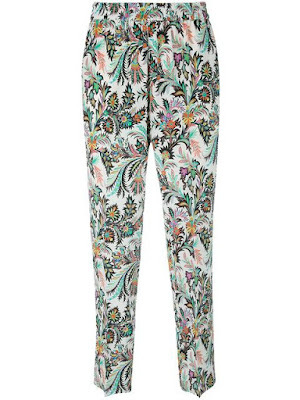 The second one was a grey blazer with a printed top. 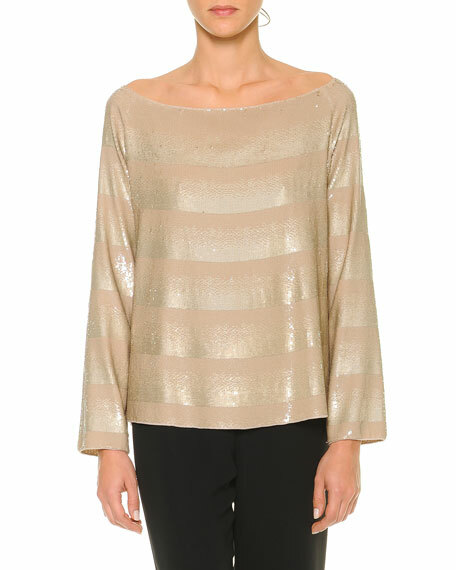 I believe both of these are by Armani as the top reminds me of the Armani top shown below. 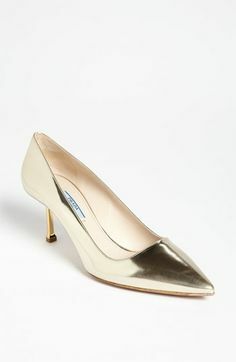 For the second Garden Party on June 30th, Grand Duchess Maria-Teresa wore an Armani top with gold Prada pumps. 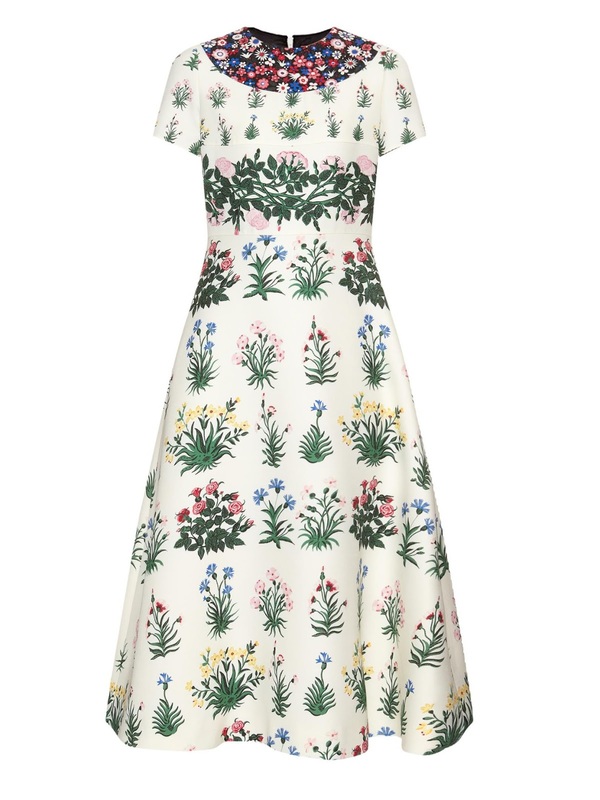 Stéphanie wore a Valentino white printed dress. 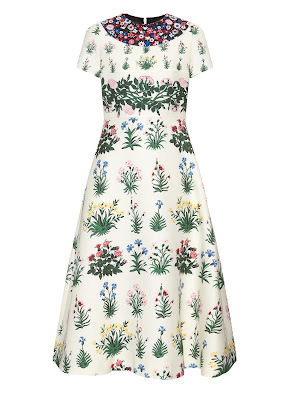 This primavera print was a trademark of their Pre-Fall 2015 collection, as shown by the dress below. 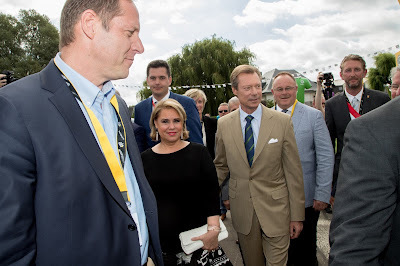 On July 4th, Grand Duke Henri and Grand Duchess Maria-Teresa were in Mondorf-les-Bains to attend the start of the fourth stage of the Tour de France. 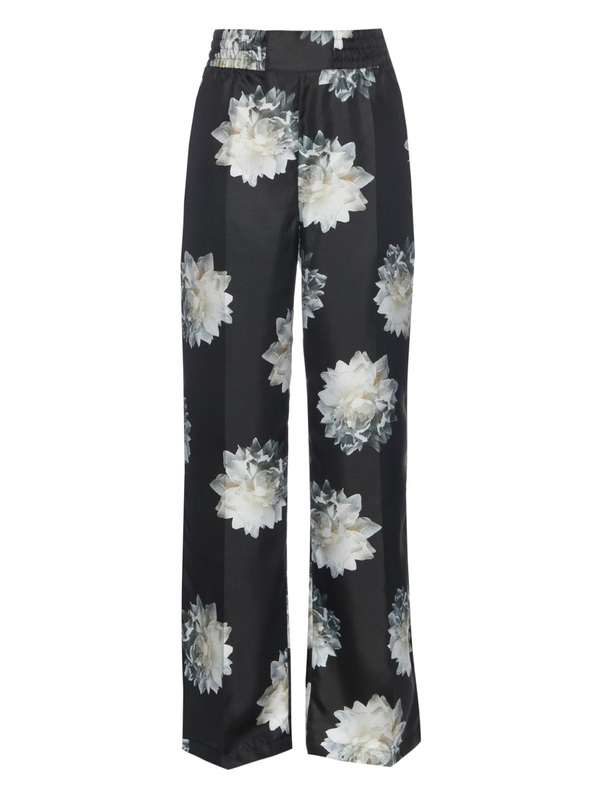 Maria-Teresa wore old black printed Max Mara trousers with a white clutch that I believe is by Bottega Veneta. 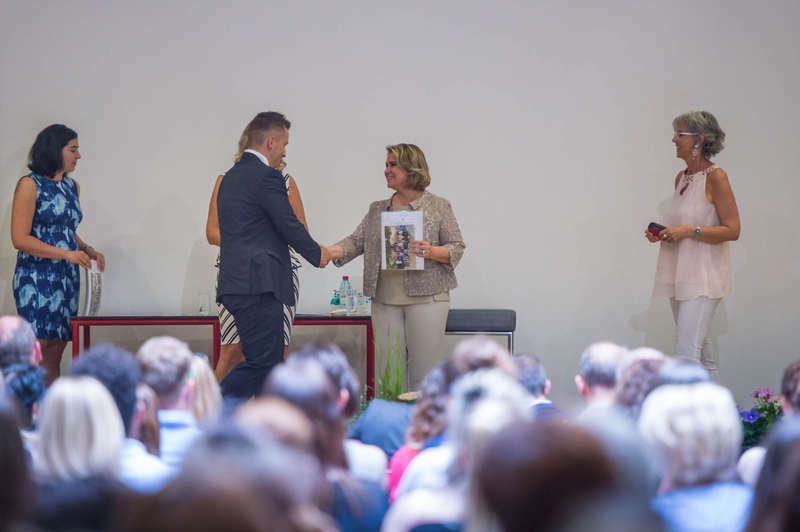 On July 5th, Maria-Teresa attended a conference about micro-finance. 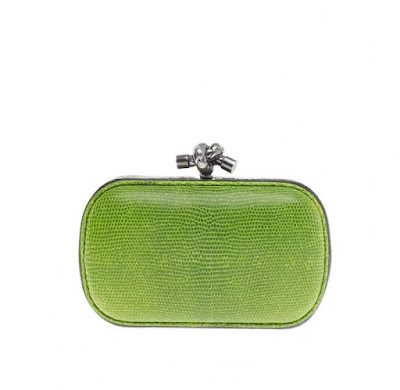 She wore a green printed jacket (possibly Armani) with a green Bottega Veneta clutch. 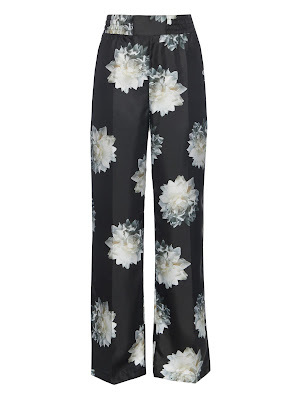 What did you think of Maria-Teresa and Stephanie's latest outfits ? During the event, guests were afforded the opportunity to taste-test a selection of fine wines and enjoy a meal prepared by Chef Michel Guérard. The evening closed with fireworks over the vineyard. A little more from Point de Vue. The Grand Duchess, a long-time supporter of micro-finance, attended the 40th Midi de la Microfinance intitulé Microfinance. This conference had the special significance of not only being the 40th edition of the conference but also the 10th anniversary. The ADA event brings together Luxembourgish organizations, businesses and residents. This conference focused on bringing financial services, loans, credit, systems of payment and other services to female entrepreneurs in Africa. These women often face social stigma in addition to lack of basic services. The financial service industry is not historically available to low-income populations. The initiative hopes to offer financial services, support and information to the target demographic while working to help them have the tools needed to carry on despite having to work five times harder than a similar male entrepreneur would. Micro-finance is an important tool for creating economic growth in areas where budding entrepreneurs would lack access to needed funding, payment systems, credit and knowledge. Hereditary Princess Sophie and Prince Nikolaus Award "The Roof"
On the 5th, Hereditary Princess Sophie and Prince Nikolaus were present to give out the award to "The Roof," the overall winner of a project competition that will help expand the current facilities of the Liechtenstein Red Cross (LRK). 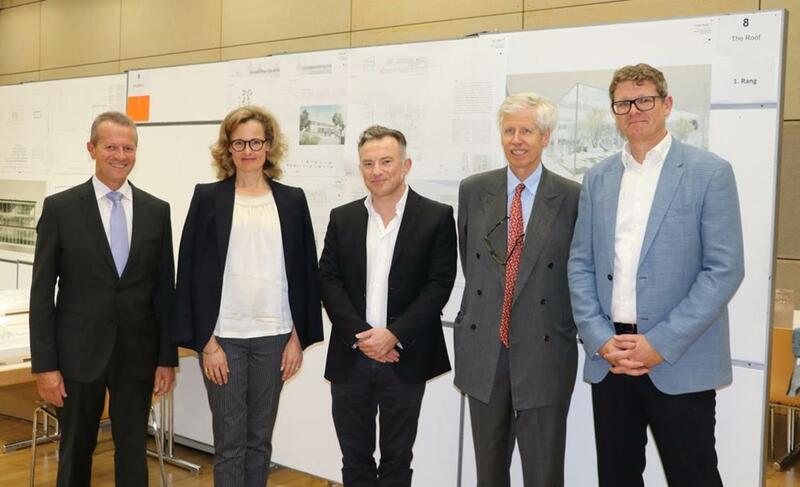 The competition, announced by the Vaduz Town Council, began in October of 2016 and ended on June 13th. Candidates were required to hand in their plans for expanded buildings within the requirements of the available building permit. For this competition, there were 27 initial candidates and 23 candidates approved for proceeding. Of these 23, five were given awards, including "The Roof," which won the main prize. 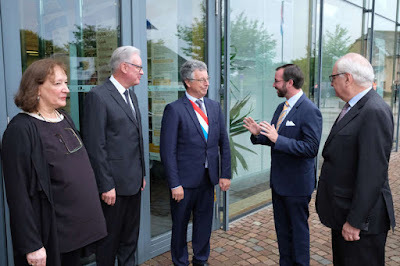 Grand Duke Henri and his perfectly Nassau-coloured tie were welcomed in the state chancellory of Hesse by Minister-President Volker Bouffier before laying a wreath of flowers at the Nassauisches Landesdenkmal featuring a statue of Grand Duke Adolph. The statue was inaugurated in 1909 by then Princess Marie-Adelaide and Charlotte, who went on to become grand duchesses. The day was rounded off by a visit to Schloss Biebrich, where an academic session took place, the Grand Duke pronounced a speech and an exhibition was viewed. For more pictures have a look at the cour and Wort. 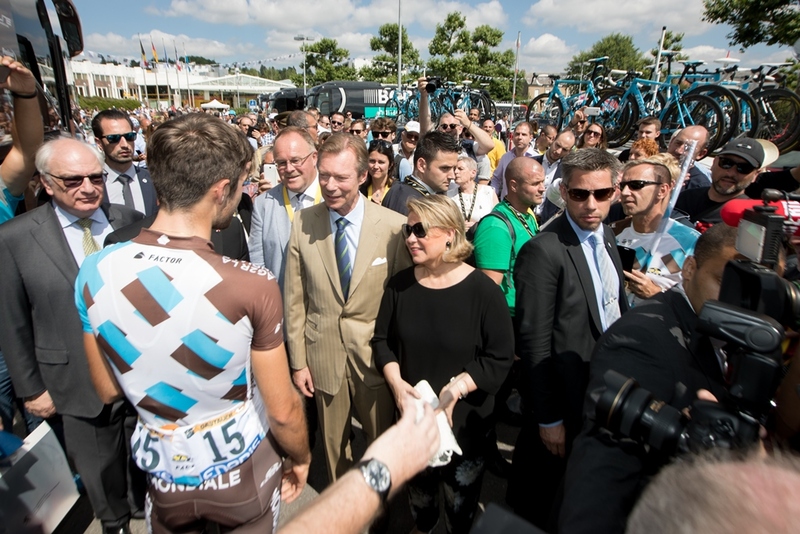 Grand Duke Henri and Grand Duchess Maria Teresa were on hand this morning for the start of the fourth stage of the Tour de France. The third stage of the world's most legendary cycling race yesterday already led through the Grand Duchy from north to south. 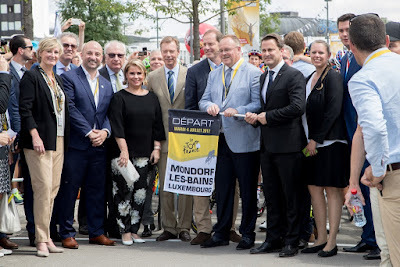 The fourth stage of le Grande Boucle today started in Mondorf-les-Bains in the south of the country before cyclists left the Grand Duchy via Schengen, that tiny Luxembourgish village where the Schengen Agreement was signed that let's you travel through a borderless Europe. 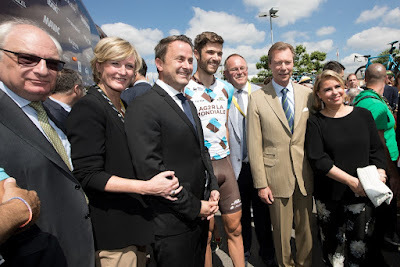 The Grand Duke and Grand Duchess also met several politicians including PM Bettel, Tour director Christian Prudhomme, as well as current and former Luxembourgish cyclists including Andy and Fränk Schleck (on the picture below) alike. 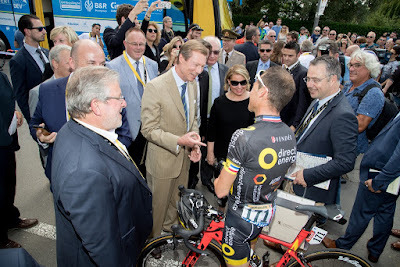 Even though Luxembourg is only represented by one rider, namely Ben Gastauer (seen talking with the Grand Duke and Grand Duchess below), the Grand Duchy has long and strong ties to the Tour de France. 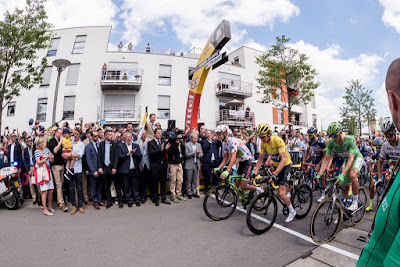 Considered the world's hardest cycling race, four Luxembourgers have one the Tour de France. François Faber won in 1909, Nicolas Frantz in 1927 and 1928, Charly Gaul in 1958 and most recently Andy Schleck in 2010. 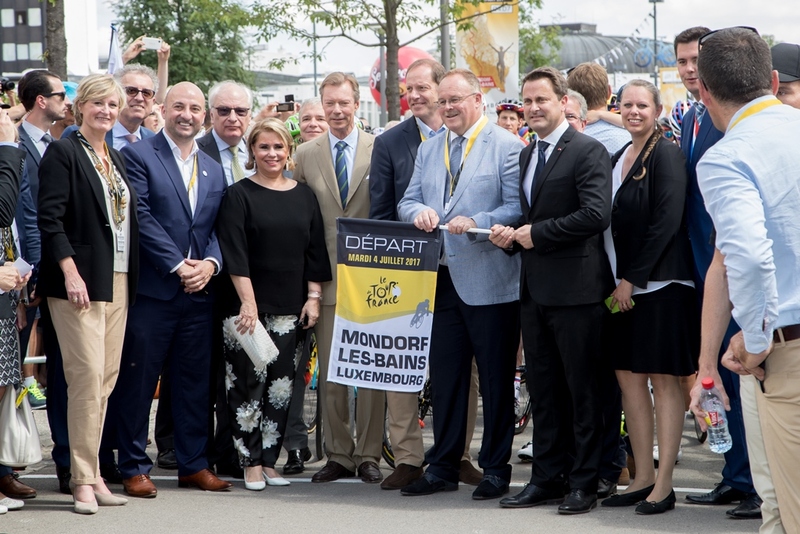 All in all, 70 stages of the Tour have been won by Luxembourgish cyclists and ten riders from the Grand Duchy have collectively worn the prestigious yellow jersey for 91 days. For more random facts about Luxembourg and the Tour de France, have a look here. Last night, Prince Wenzeslaus, nephew of Prince Hans-Adam II, attended the amfAR dinner at Le Petit Palais in Paris. AmfAR, or AMerican Foundation for Aids Research, is an international nonprofit organisation dedicated to the support of AIDS research, HIV prevention, treatment education, and the advocacy of AIDS-related public policy. On Saturday, Hereditary Grand Duke Guillaume was on hand to celebrate the 10th anniversary of Cube 521. The decennial anniversary of the regional cultural centre in Marnach, a part of Clerveaux, was celebrated with an academic session. The cour has more pictures of the event. 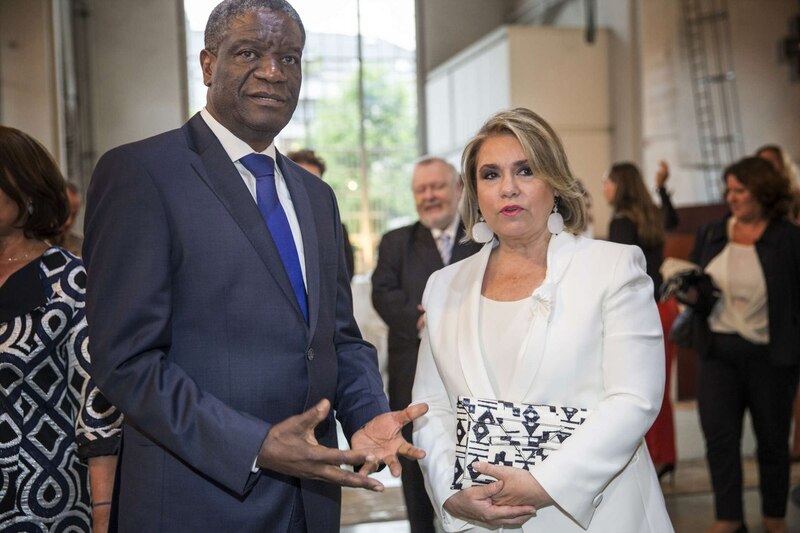 During her June 29th visit to Geneva, Grand Duchess Maria Teresa also attended three separate meetings, all focused on the ongoing need to support women and children facing wartime violence. The Grand Duchess first met with Dr. Margaret Chan, who is the Director General of the World Health Organization. Dr. Chan noted her personal support for the upcoming international symposium on wartime sexual violence, which will be held in Luxembourg in March of 2019. 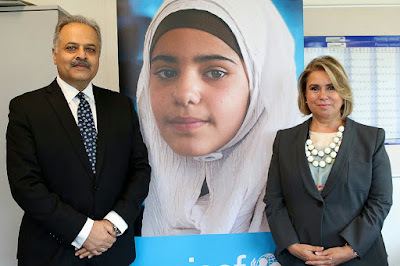 Following this, Grand Duchess Maria Teresa met with Sikander Khan at the headquarters of the UNICEF Emergency Programs Office to discuss the forum and the 500 million children who face violence during wartime. Finally, the Grand Duchess met with Prince Zeid Ra'd al-Hussein of Jordan, the High Commissioner for Human Rights, who agreed about the importance of addressing wartime violence, particularly against women and children, and also indicated his support for the symposium.